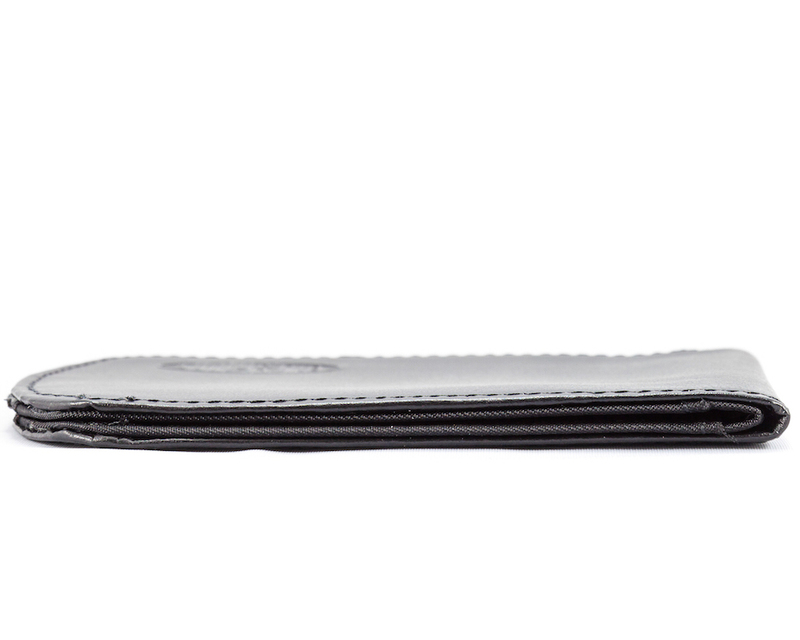 Our super slender bi-fold curved leather wallet from Big Skinny wallet is more than five times lighter than an ordinary wallet. 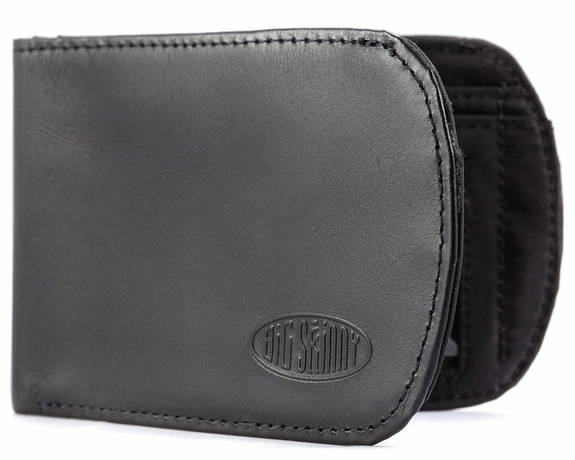 It has two rounded edges to easily slide into any front or back pocket. 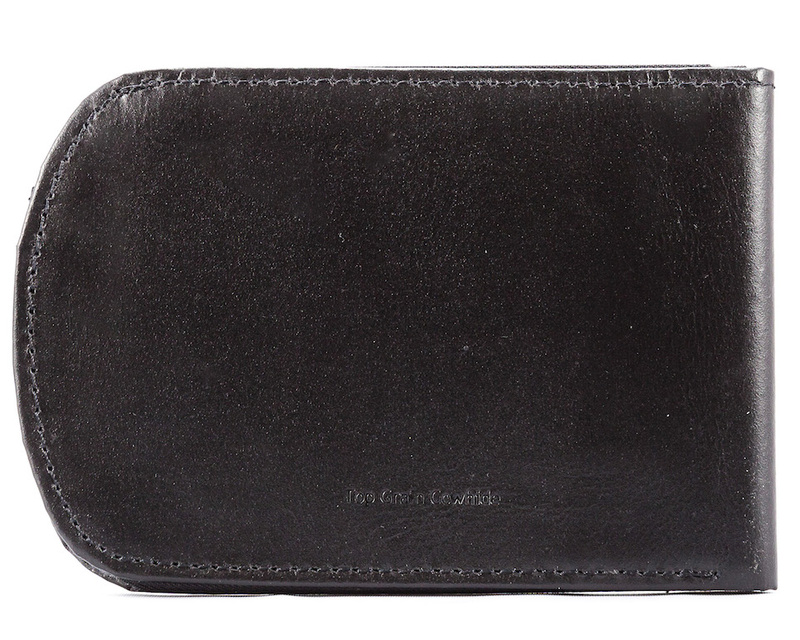 This front pocket leather wallet has a premium leather exterior and high-tech nylon microfiber interior with plenty of non-slip pockets to hold your ID, up to 20 credit cards and cash. 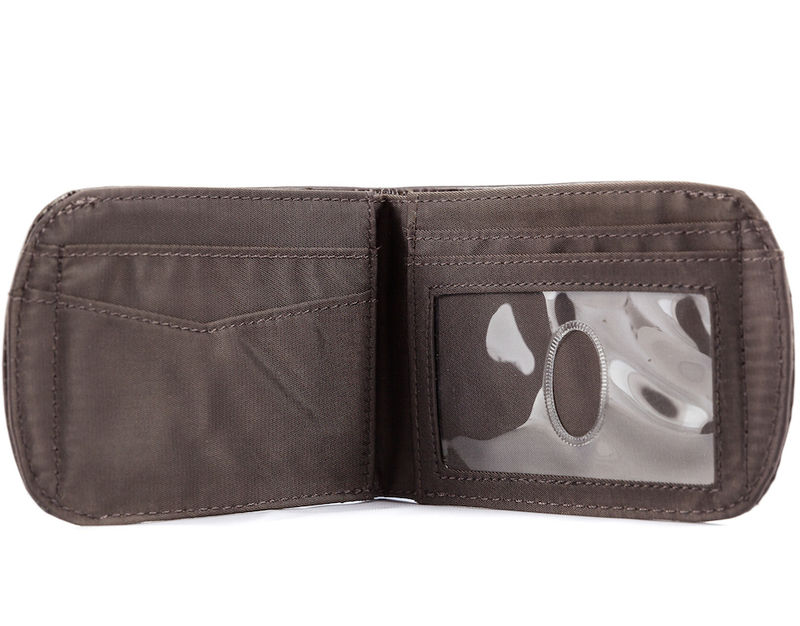 Our bi fold measures just 4 5/8 inches wide by 3 1/8 inches tall - about the height of a dollar bill. Order yours in tuxedo black, chocolate brown or lipstick red. It feels so light in your pocket, writes one customer, "I keep thinking I left it at home." 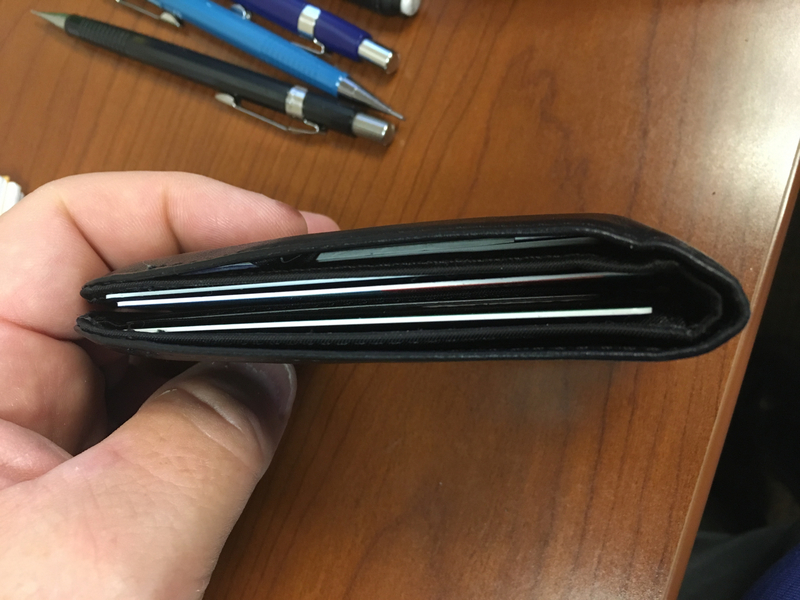 Another fan wrote to say he'd bid goodbye to back pain after trading in his weighty wallet for our amazing lightweight curved leather bi-fold. 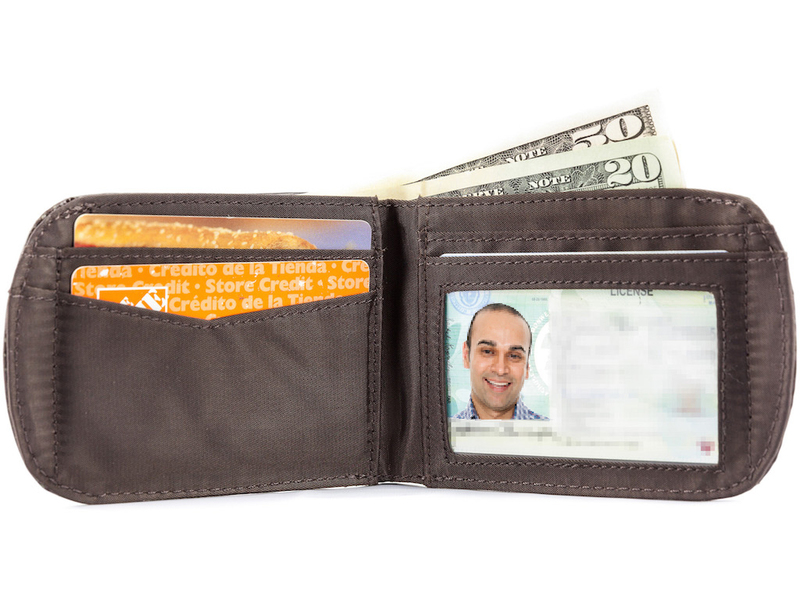 Hundreds of happy customers have made this one of our best-selling billfolds. Buy one, and discover why. Your aching back will thank you. My husband has a Leather Curve that has been carrying for years. He loves it! My grandson just started driving and wanted a new wallet just like it. We gave him one and he loves it just as much! Thank you for making a wonderful wallet!! I've gone through a lot of wallets, including making my own. This hits all the right notes. I don't think I can ever go back. I used another style of Big Skinny wallet before that needed to be replaced so I decided to try something different. This one is more walletesque than the one I had before (double sided card holder style) so it�€™s a bit more bulky. 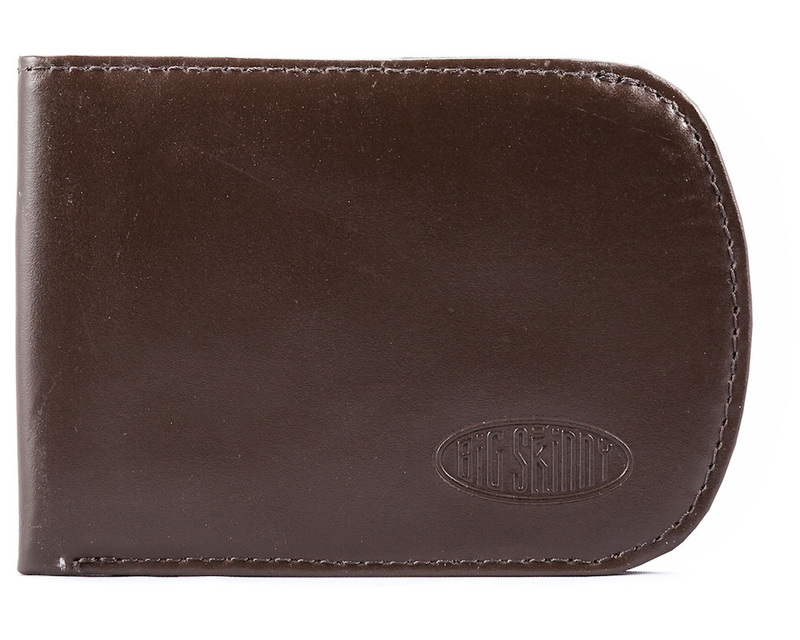 But still less bulky than a normal wallet. 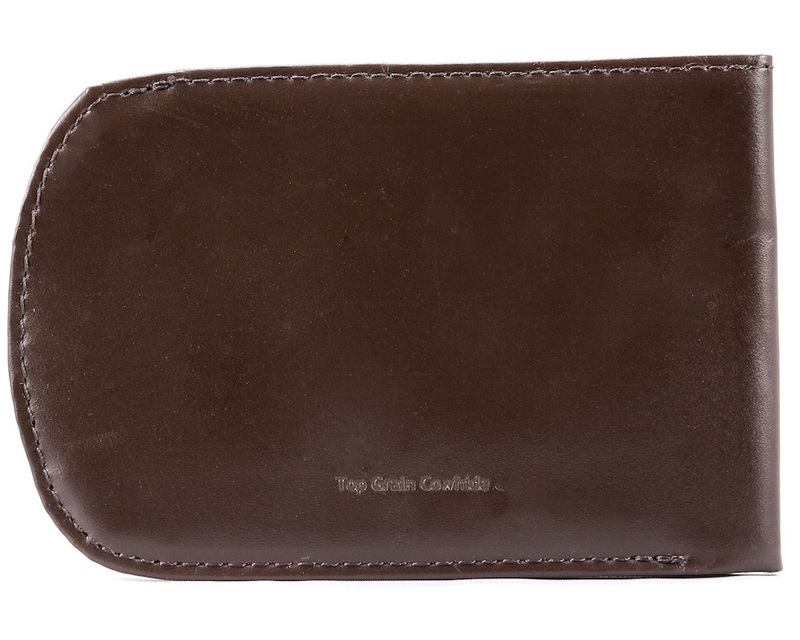 It can easily get crammed if you dont manage what cards you carry regularly. I don�€™t like the extra rounded edge, seems like extra, unnessecary fabric. But maybe that helps with making it narrow. I do greatly enjoy the color (ordered the red option) and quality of material. Great little wallet. My daughter slips it into the back pocket of her scrubs and it's a perfect fit! I was on my second vinyl curve and after 2.5 years of everyday heavy usage the interior non slip material started to break down and it was looking old (the rest of the wallet is perfectly fine). I love the thinness and design of the curve and figured I would try the leather version as an upgrade over the vinyl. It is slightly thicker than the regular curve (basically replaces the outer layers with leather, but has the exact same interior material and design which I love. The only "issue" is that the leather has a unique odor that has dissipated some with use. I already like the stamped big skinny logo versus the hard plastic one on the regular curve. It does serve a purpose of telling me which way the wallet is in my front pocket. I've carried my wallet in my front pocket for years but they we're so bulky. 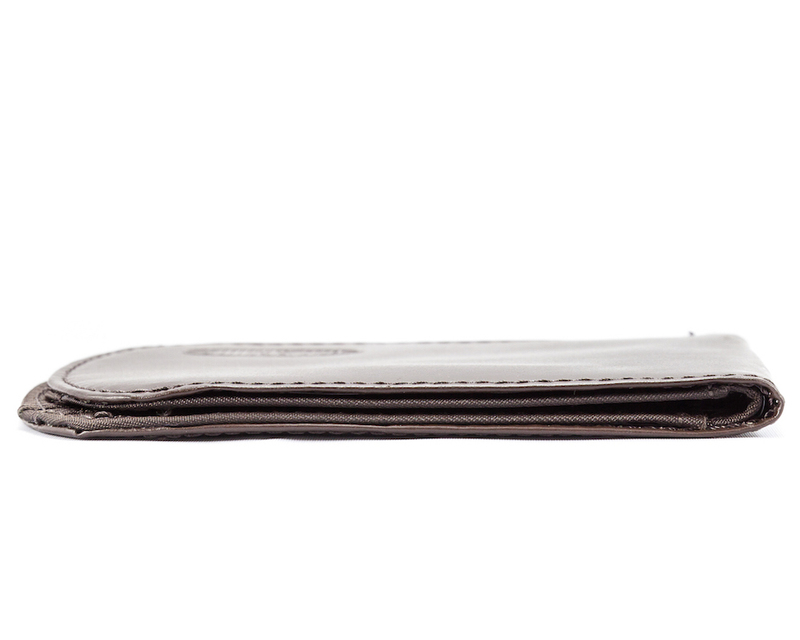 I tried The Curve and will never use another wallet. This is my second one. The first one lasted for several years and it was time to replace it. 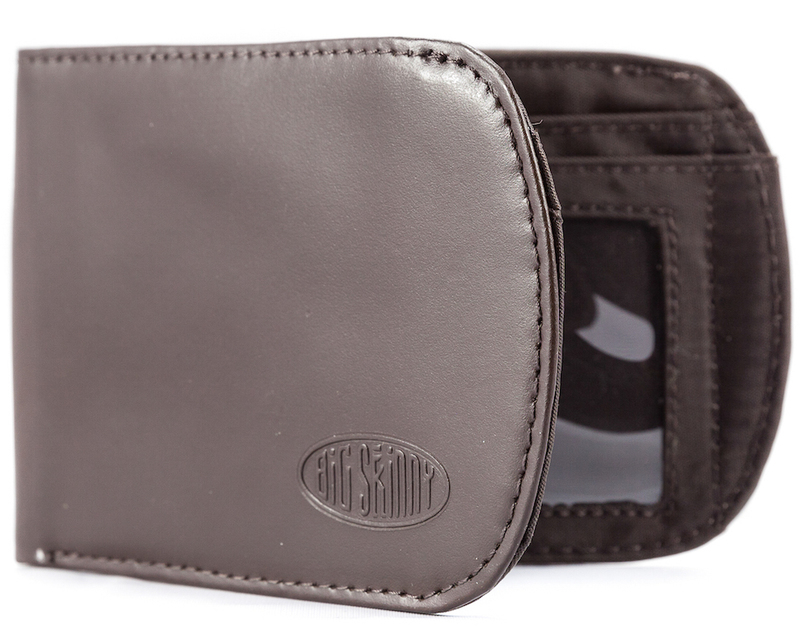 It holds a lot, keeps your credit cards secured in place and is thin when filled. I highly recommend this. 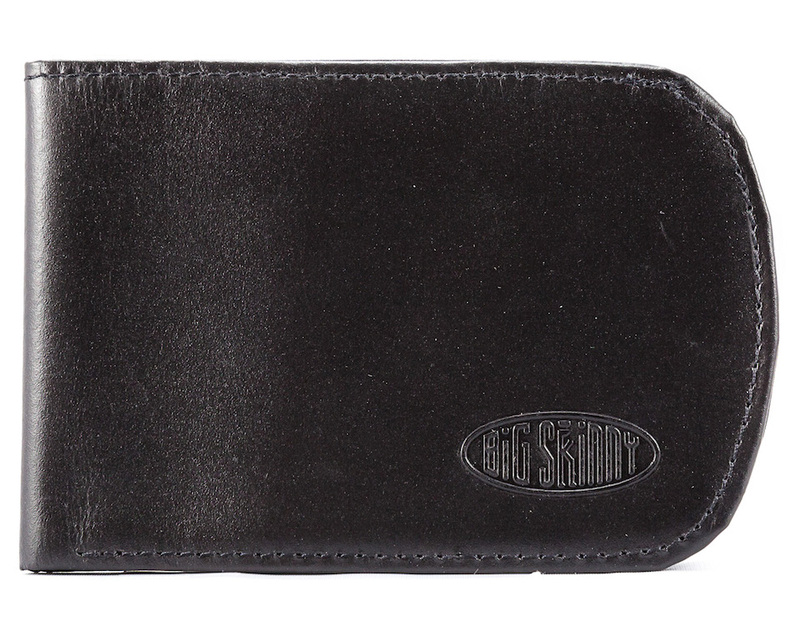 This is the second Curve wallet I've bought from Big Skinny. The first was brown RFID, this new order was the red (love it!) but is not available in RFID. I give this five (5) stars despite that I wish i could merge the two: red RFID. P.S. I bought RFID sleeves for my cards that I keep in my red wallet. I found them cheaper than here at Big Skinny, but I can't comment on the relative quality. ProsGreat red color. Handsome and stylish, almost like cordovan / burgundy. Curve design perfect for my front pocket. Skinny! ConsI wish the red came in RFID. Just replaced my old curve after 3 years of kickin around in my front pocket. 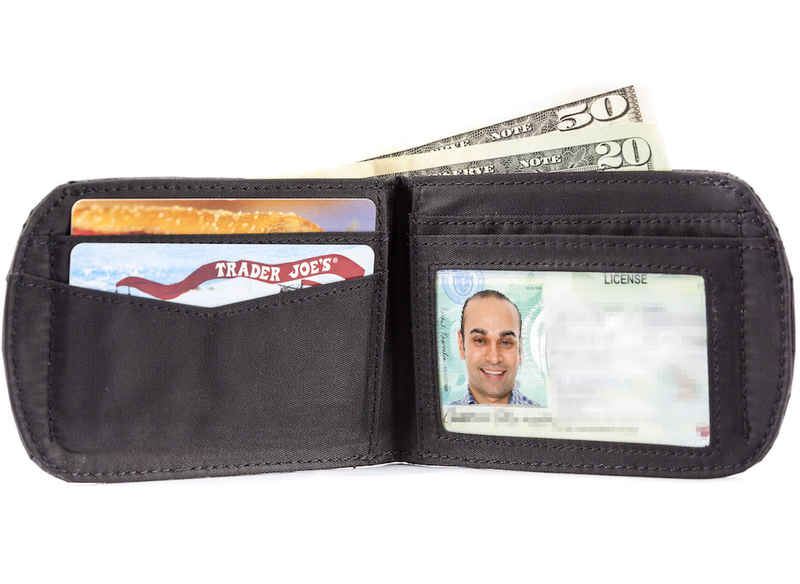 For my money (heh) this is the best everyday wallet around. I've been wanting to buy the blue model but it always comes up as " out of stock". 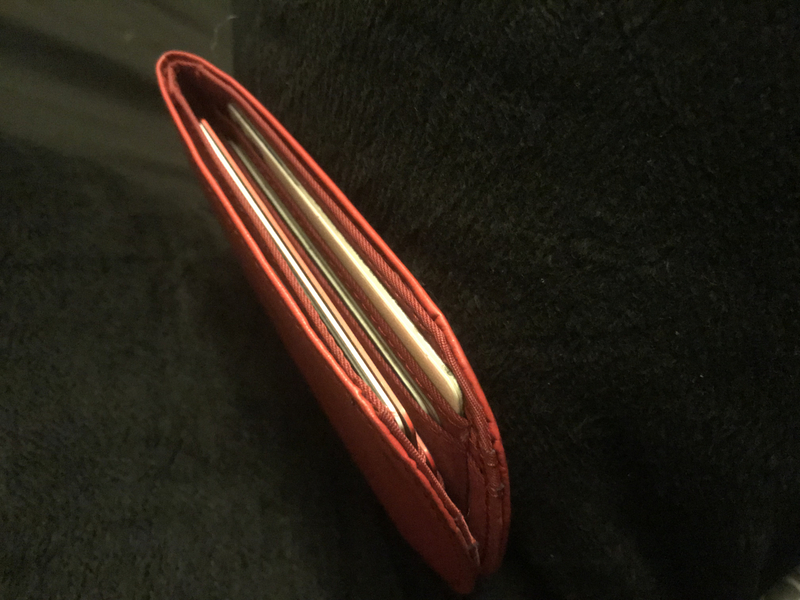 I have purchased 5 Skinny Wallets over the past year. They are great for gifts and I am on my second one. Bought this one to replace my original Curve version that finally was wearing out on the inside. I decided to give the leather hybrid version a try. Overall a very good thin wallet but I think I still prefer the original version for overall thinnest and lighter weight. Since it does have leather, it took a little to �€œbreak in�€ and be a bit more flexible. But not really a big issue. 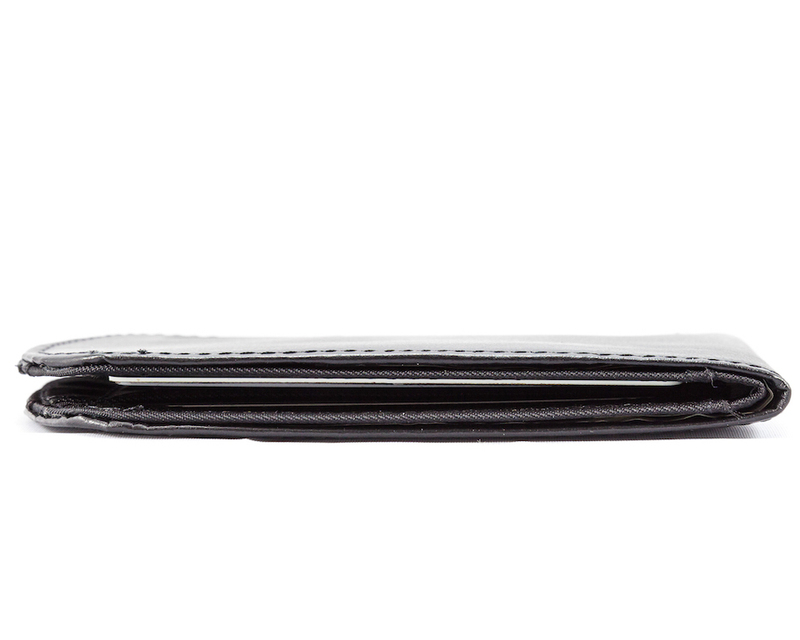 I would recommend if you want a thin leather wallet.